A bee hive can contain 60,000 bees plus more than 100kg of honey. The only complete removal solution is a cut-out. This is a process of physically removing the bees and all hive material and requires the disassembly of parts of the wall or ceiling sheeting to expose the nest. Failure to remove all comb and fill the void with insulation will almost certainly result in another swarm moving into the space, even if the previous colony has been poisoned. This is an example of a 3 YEAR old hive. This is an example of a 3 DAY old hive. Swarms can happen at all times of the year on the Sunshine Coast but are most common from late August to January. A swarm is quite different to a hive or nest as it is a colony of bees transitioning to a new home. They are often seen as a ball of bees hanging in a tree, on a fence or the side of a building. It is important to know that swarming bees are usually very gentle and unlikely to be a danger if left alone. Never spray a swarm with insecticide or water and do not try to make it move on. 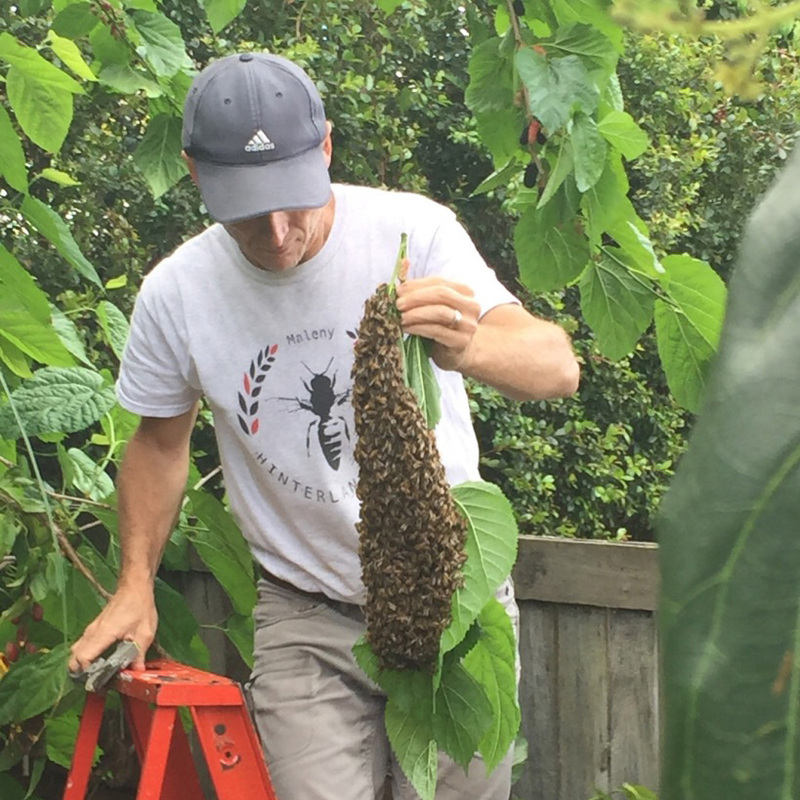 Call a beekeeper who can safely relocate it. This a method of bee rescue most commonly used to remove bees from trees and other cavities that can not be accessed. It is not a method recommended for removing hives from buildings as it does not remove any of the stored honey which, if left will degrade possibliy causing extensive damage to the building and attracting other pests including small hive beetle, cockroaches, ants and rodents. The trap-out process basically allows bees from the hive to leave but not return. A lure hive is setup outside the original hive entryfor the trapped-out bees to relocate into. While less invasive, the process can take from 3 to 5 weeks to complete and requires several visits by the apiarist.